So since the ascent of my shoe size has begun (pregnancy will do that to you), I have been on the hunt for some cute new flats a half size bigger. 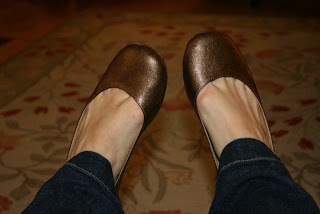 Target came through for me again - and at $12.99, I figure these bronze flats are a steal! Thanks, Target for keeping me somewhat stylish during pregnancy. Cause we all know that pregnancy is no excuse for being out of style! One thing I really hate about winter up here is not being able to wear cute shoes like that for like MONTHS!! Just past the halfway mark! 2 Years Today. Oh Happy Day!